Suddenly, I was surrounded by horses. Curious horses. They were interested in my camera, tripod, and me. After they satisfied their curiosity, I got the chance for close-ups of the small herd with the Pacific Ocean in the background. It was May and a glorious spring day. I was standing at the top of a valley covered with spring grass, overlooking the Pacific. My assignment? A photoshoot of Deerhaven Ranch in Bodega, California. The pay? $500 for 20 photos, $157.52 for mileage, and a $50 per diem. So how did I get this fantastic paid photo shoot? 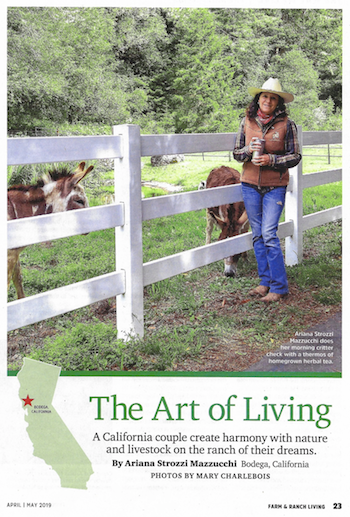 I pitched a story to Farm & Ranch Living Magazine about Deerhaven, a sheep and horse ranch. My article query included an album of photos I took when visiting the ranch for another assignment. I received a note from the editor saying they didn’t want my story but wondered if I would be interested in doing a photoshoot if the rancher, Ariana, would write a 30-day personal journal. I said yes, and so did Ariana. Before this happened, I used to give my photos away as an extra incentive for publishers to accept my stories. Farm & Ranch Living showed me the value of my work in a big way. One thousand dollars was much more than I was earning for even five stories and photos. What a wake-up call. Now I see my photos as something more than an incentive to editors. I’m shying away from publishers that not only pay a low fee but expect free pictures. I’ve begun to look for other outlets as well. 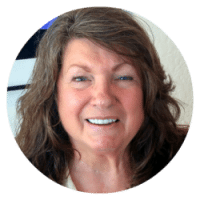 As a member of my local Chamber of Commerce, I’ve met local business owners who need photos. When setting up press trips, I make sure my host knows I will be shooting stills and videos. That has resulted in small sales to two visitor bureaus. My visits to local wineries and vineyards have brought a few sales of images of special events such as barrel tastings and wine club parties. I’ll be pitching my photos to new publications this year. I’ve begun looking at editorial calendars for travel outlets. When I have pictures that fit upcoming topics, I send a query and some samples. Many magazines and newspapers pay nicely for images—not all expect them with stories as a freebie. Since that first photo shoot, I’ve been contacted by the parent company of Farm & Ranch Living, Reader’s Digest. They publish 13 print magazines and hundreds of books. All need photos covering cooking, food, gardening, birding, and farm and ranch lifestyle. They’ve invited me to join their list of approved photographers that their magazine and book editors use to fulfill assignments. I was thrilled to accept. Learning the value of my photos has added another revenue stream to my travel writer’s career. It’s also given me pride and confidence in my photographic work. Videos will be the next product I offer. 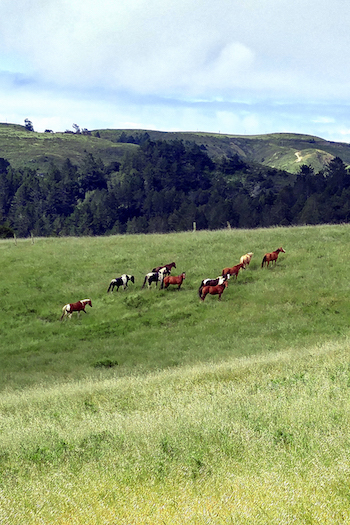 I wonder what the going rate is for 30-seconds of horses running through a green Pacific Coast valley?